Television trends are usually hit or miss with me, but I could not be more excited about the recent dual-headed obsession with horror series and anthologies. The CW is bringing those two concepts together for one of the more exciting remakes I can imagine, as they’ve given a pilot order to a reimagining of the excellent 1980s anthology Tales from the Darkside. The CW just keeps getting better and better. Says the guy who hasn’t been a teenager in a long time. The fact that this particular brand of off-the-wall horror has the potential to come back full-time is outstanding, and it’s being written by Joe Hill, the Bram Stoker Award-winning author behind such superbly odd novels as Heart-Shaped Box and Horns. He also happens to be the son of Stephen King, so you know that his imagination is pretty vast. Check out his short story collection 20th Century Ghosts, particularly “Pop Art,” for a good idea of where Tales from the Darkside might go in his hands. 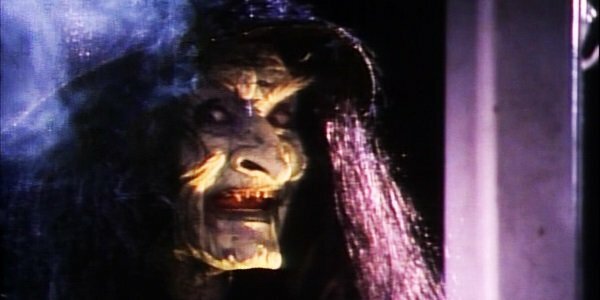 The original Tales from the Darkside ran from 1984-1988, spawned a feature anthology, and had an opening theme that instantly made everyone who heard it feel like a Peeping Tom looking into another dimension. It often adapted stories from the masters of the genre, such as King, Clive Barker and Harlan Ellison, with tons of guest stars. Filmmakers like George Romero and Tom Savini got behind multiple episodes, and this series was often more about monsters and other weird things rather than the serial killers and vengeful husband-murdering wives of other shows. This mask gave me such heebie-jeebs as a kid. According to Variety, The CW ordered two more pilots, both from established TV vets. Vampire Diaries showrunner Julie Plec has Cordon, a remake of a Belgian series centering on a city-wide epidemic in Atlanta that puts the city under quarantine, stranding those outside the danger zone. Californication creator Tom Karpinos wrote the pilot Dead People for Warner Bros. TV and Bad Robot, and it’ll follow a cab driver who is both skilled at being an alcoholic and talking to ghosts following a near-death experience. No word on when any of these dark projects will go into production, but the quicker Tales from the Darkside comes back into our lives, the more doctors will have to worry about people having night terrors.